Individual arrival to the valley station of the Gletscherbahnen Kaprun - lots of parking spaces free of charge! Continue on the glacier Kaprun-Kitzsteinhorn: Take the cable cars / gondolas to the Alpincenter (exit Gletscherjet 2 at the top). Note: Buy a valid lift ticket (= ski passes for the duration of your stay) at the bottom of the ticket office. 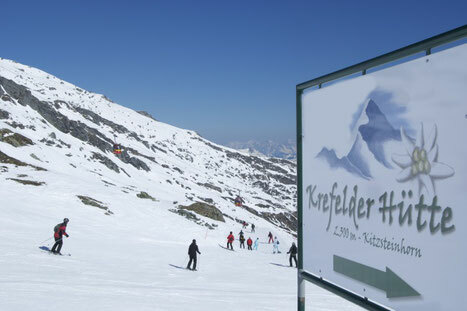 From the Alpincenter, descend down the slope 11 (blue) in the direction of Langwied turn-off to the Krefelder Hütte (on the right handside) - and then take a few easy turns through short, unploughed terrain (hut access) to the Krefelderhütte. For a practical journey, we recommend traveling with backpacks instead of suitcases. Luggage transport from the mountain station Gletscherjet 2 / Alpincenter to Krefelderhütte or back is only possible in the morning or later in the afternoon. Price: 12 € per trip. Passenger transports are generally not carried out.